Hello! Today I had a lot more time then usual to try something different! So here it is! 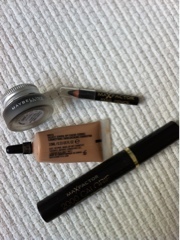 I used my usuals as pictured, my MAC Select cover up all over my lid and under my eyes, I then lined my eyes with a Kohl pencil by Maxfactor. 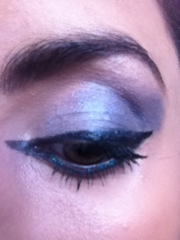 I lined my eyes different today, egyptionesque (if thats a word!). 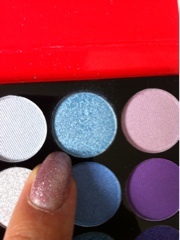 I then used my main focus colour a light purple/blue tone all over my lids. 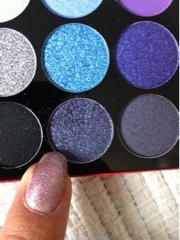 I then smudged in the edge a darker shade of blue, and blended. 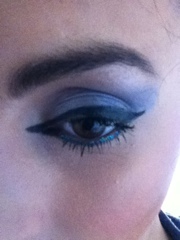 I then used my MAC liner in Peacocky on the lower lash line and added my gel liner on top of my kohl outline to add depth. 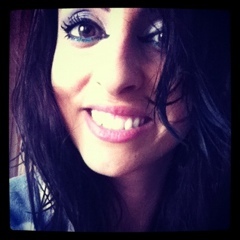 Finally lashings of mascara and Benefit brow kit to define my eyebrows. 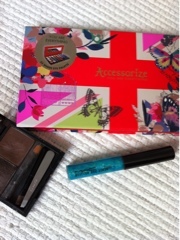 Accessorize palette, Benefit brow kit and MAC Peacocky liner! ﻿﻿﻿Not sure why but I was unable to seperate these two photos!! Arrghh! But see below the darker shade of blue for the edge of my eye. Love it!! The eyeliner looks great on you! 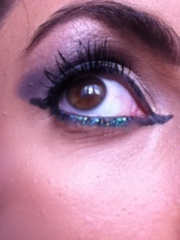 When I apply my eyeliner like that, i get bug eyes hahaha like on my last makup look. It looks really lovely on you though!